Summertime is upon us which means that it's time to hit the road while you take advantage of your paltry 12 vacation days a year. Have you ever been on the interstate and wondered what that shiny, new 2007 Ford Mustang would look like after a head-on collision? 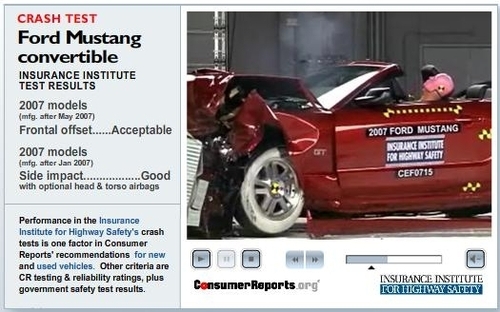 Well Consumer Reports was kind enough to post their videos of crash tests of tons and tons of cars. Just pick the car manufacturer and model and then sit back and watch it get it totaled. New York's ubiquitous yellow taxi cabs are due for an upgrade. 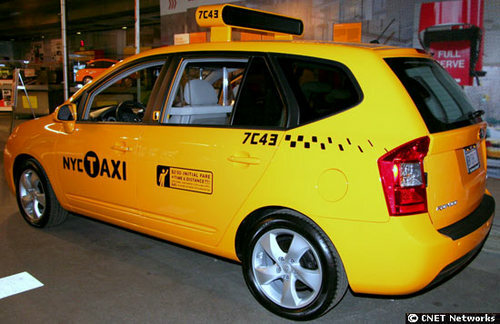 If you happen to be in New York between now and the 15th you can wander over to the New York International Auto Show for the Taxi 07 Exhibit which features some of the newest innovations for New Yorker's favorite form of transportation. This exhibit is also in celebration of the yellow taxi's 100th year in New York. 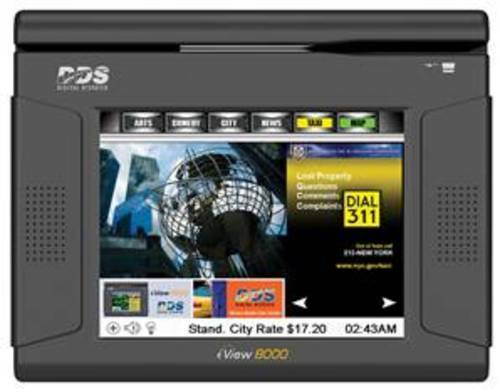 The easy to read graphics on the side of the cab pictured above will be seen on all of the taxis in the city by the end of the year. There aren't any set prices. Prices are completely fluid based on the number of cars on the lot, when the lot is full you can get great deals. Extra rental insurance is totally unnecessary. That being said, agents will generally knock down the daily rate of your car if you're willing to pay for the extra insurance. Most Enterprise business comes from insurance rentals. If ready to lie and say you're renting a car as a replacement you can sometimes knock as much as 50% off the price. 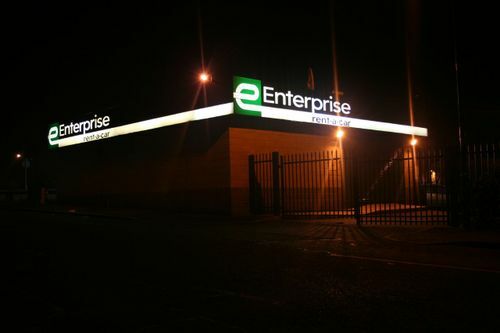 Cars are cheaper on the weekends at any Enterprise neighborhood branch. If you're looking to get a good deal on the weekend stay away from the airport and head to the city lots that are full of cars. Call on Friday right before 2pm for the best deal. 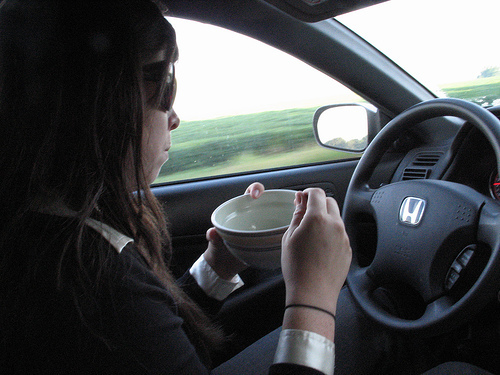 Agents love renting cars before two in the afternoon because then it's not counted on the branch's books for the day. Enterprise managers really, really want a 5 out of 5 rating on customer service. Apparently managers are so keen to get a 5 out of 5 rating from customers that they will happily wave the fees for such things as forgetting to fill up the tank. Your price depends on the agent's mood. Agents hate having to schlep customers from their house and you'll get a better rate if you walk in rather than making them come get you. Roger, Roger. Why Do We Say "Roger?" Pilots and other military types say “roger” to acknowledge receipt of a message or instructions. “Roger” at one time was the phonetic designation for the letter R, which in turn stood for “received.” Why not just say "received"? From a safety perspective, it makes sense to use standardized language, particularly when dealing with international operations. An American pilot may not understand German, but they both understand aviation terminology. The International Civil Aviation Organization oversees this standardization and disseminates it accordingly. The use of “roger” isn't all that old. In the military's phonetic alphabet, "roger" didn't become the designation for R until 1927. (Previously the designation had been "rush.") The first citation given by the Oxford English Dictionary for “roger” in the sense of "received" dates from 1941, coinciding with U.S. entry into WWII. The term made the big time in 1943, when the Army Signal Corps incorporated it into one of its procedural manuals. In 1957 "roger" was replaced by "romeo," the current designation, but by then "roger" = "received" was so entrenched that the brass knew better than to try and change it. Captain Oveur (Peter Graves): Roger, Roger. What's our vector, Victor? Variations on this theme include Oveur/over and clearance/Clarence. Trust me, it's pretty funny in the movie. As for Roger’s last name, “wilco” dates from the same time, and is simply an abbreviation of “will comply.” So the pilot who invokes our friend Roger Wilco is saying “I understand you, and will follow your instructions,” only cooler and shorter. Google Maps keep getting better. They've recently added traffic patterns for major cities (an option that was only previously available on mobile versions of Google). 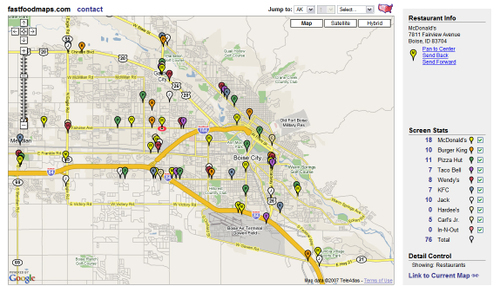 To check it out just click on the "Traffic" button that now appears next to "Map." Gray is for the places where they don't have data, Red means that traffic is at a crawl (less than 25 miles per hour), Yellow means that traffic's going between 25-50 miles per hour, and Green means everything's moving along just fine. 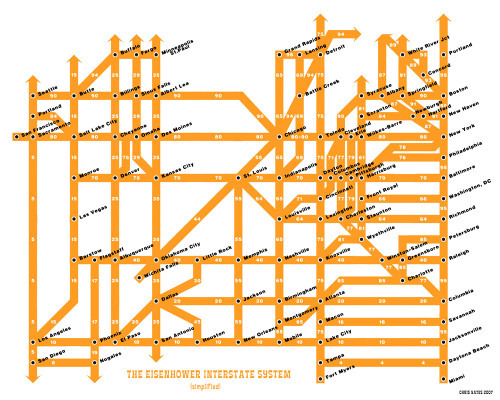 This is by far the easiest way to understand the nation's interstate system. Artist Chris Yates has designed this beautifully simplistic map of the US interstate system in a style similar to subway maps. Pretty neat. 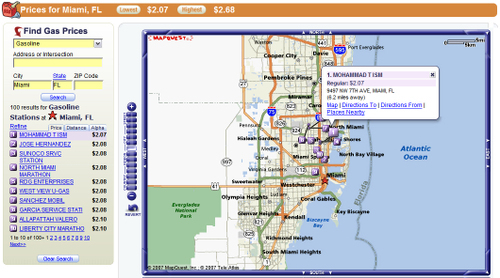 MapQuest has gotten into the mashup business, and they're helping us find cheap gas. They also include prices for diesel, biodiesel, and hydrogen. It's interesting to see the differences in gas prices across the country and rewarding to find the cheapest gas (most cities have at least a 50 cent difference in price). Now it's so much easier to get your trans-fat on. The next time you're driving around like a chicken with its head cut off looking for a Taco Bell you can whip out your mobile and head towards fastfoodmaps.com. They've got almost 50,000 fast food joints online for cities and towns all over the country. They point to McDonald's, Burger King, Wendy's, Pizza Hut, Taco Bell, Carl's Jr and Hardee's, but we're still holding out for Waffle House. Tired of getting cut off by some idiot? See some cutie you'd like to talk to again? Have some nice guy let you merge into his lane? Now there's a website that'll let post people's licenses and you can either tag them with an award, a flag, a hazard or a wink. They've got over 50,000 members and over 25,000 plates have been tagged. 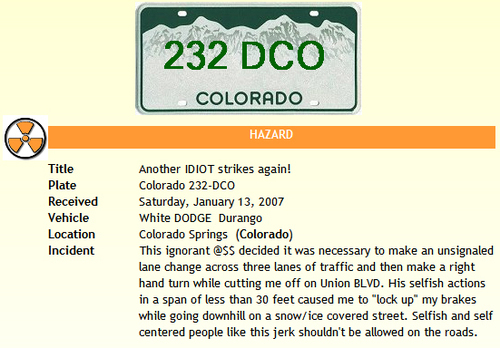 There's usually between 100-200 new license plates submitted daily. This is a great way to vent without the double-barrel shotgun having to get involved. 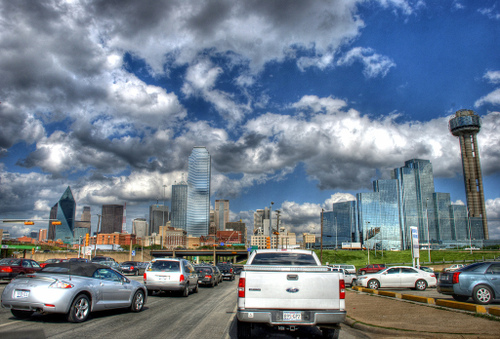 Parking in major cities can drive anyone nuts. 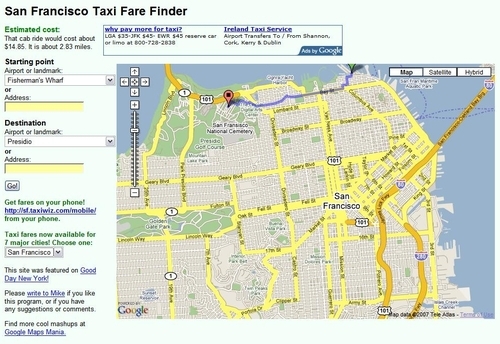 But now a new startup called ParkWhiz is hoping to make it a little bit easier. If you're living in Chi-town or Philly you can check out the service. The idea is to give you an idea of what the parking situation is before you leave your house or office and let you see how full the lots near where you need to go are. Unfortunately, there's no mobile version available yet, which is what this service needs if it really wants to catch on. If you're willing to invest this much time and energy to find a parking spot it might be a lot easier to just take some good old public transport instead. Last Monday we were in Columbus, Ohio visiting Jason Laskodi, our Laughing Squid Web Hosting support ninja. While driving through Dublin on our way back from lunch, we stopped by the site specific sculptural installation of 109 giant concrete ears of corn located in Sam and Eulalia Frantz Park. 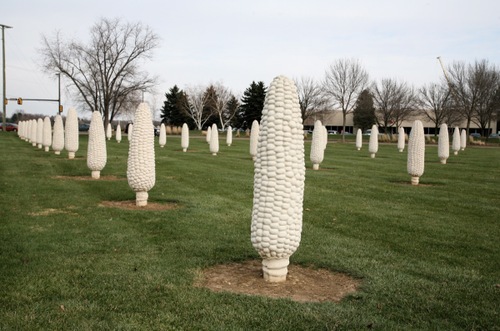 “Field of Corn (with Osage Orange Trees)” was created by Malcolm Cochran 1994 with funding from the Dublin Arts Council and is a tribute to Sam Frantz, who developed hybrid corn in the area from the 30’s through the 60’s. The installation honors the area’s agricultural past and is also reminiscent of America’s great roadside attractions. No matter what kind of deal you got this holiday season on your plane tickets, chances are you'll still get raped when it comes to paying for parking you car while you're off drinking eggnog with the family. 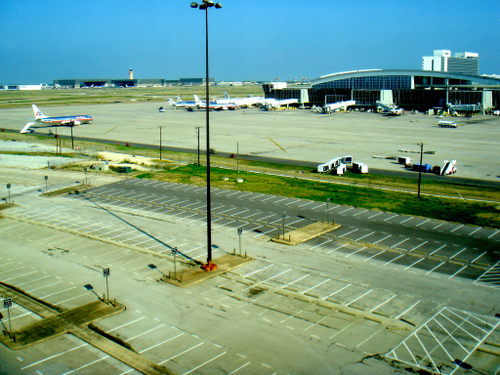 In Miami, airport officials decided to kick-off the season by increasing the prices on long term parking by 25%, but this increase still left them out of the top 10 most expensive airports in the country. It turns out Chicago's O'Hare has the priciest parking at 50 bucks a day, they are followed by Washington National ($36), LAX ($30), New York-LaGuardia ($30), and Boston Logan ($24). Get ready for the grind. 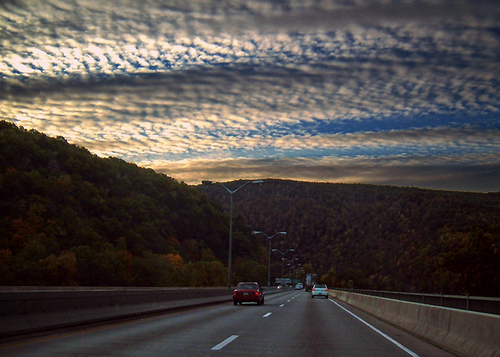 AAA and the Travel Industry Association expect over 65 million Americans to get off their couches and travel at least 50 miles from home over the Christmas/New Year's holiday. 53 million will hit the roads, another 9 million will make friends with the TSA, and another 3 million souls will bus it or hit the rails. The report also says that airline tickets are averaging about $12 a more than last year and that about two-thirds of those traveling will be crashing at friend's or relative's houses. Oh man, if we had a nickel for every time we tried to catch a buzz while we were on the go and got stuck high and dry. The Washington Post has published their holiday guide for travelers and in the $50 or less category they've featured the minibar to go, in case you can't wait for a nip. 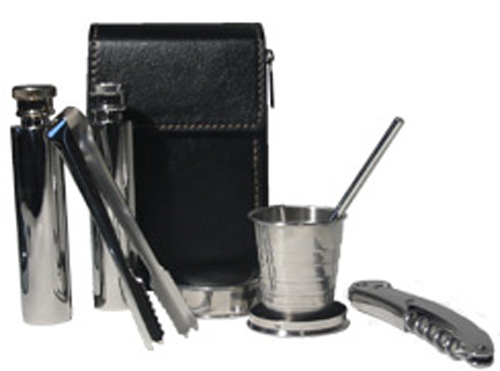 2 flasks and a collapsible stirrer are all included. 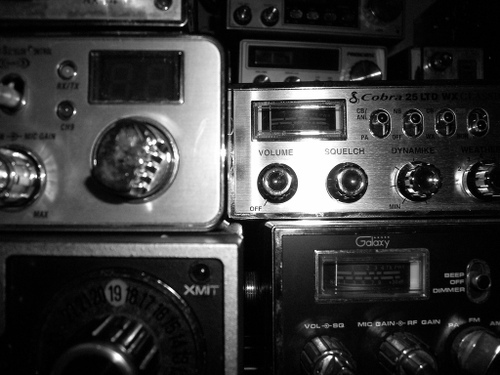 To check out other travel "must haves" head to the WP's site or once you're able to focus again go to Flight 001 where they sell heaps of travel associated junk. Meter Maids - we all hate them, all we want to do is park, is that so wrong? Discovery has come up with this neat-o little tool to help you always remember to get to your car before a parking ticket does. 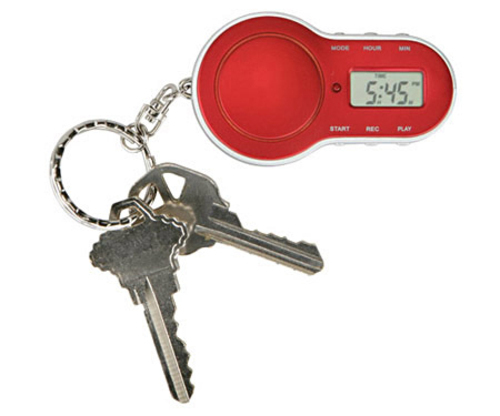 The timer can count down up to 24 hours and has a reminder that will go off in 10, 5 and 1-minute intervals. You can also record a ten second message to remind you where the car's parked. Finally, we can park in peace. So you already had your blind date on the plane after finding someone to sit next to, but now you'd like to spend some quality time with another stranger in a cab from the airport rather than just footing the $30 taxi ride by yourself. Who do you call? Hitchsters.com, that's who. If you can find someone who was actually on the website (and flying into NYC) and on your flight you guys can hook up and share a cab along with tips on how to be a cheapskate. Apparently the Stokes family was cruising down I-75 in Toledo, Ohio, in their 2002 Ford Explorer when they pulled up behind a Greyhound Bus. As they were moving down the interstate the bus appears to have let loose with a torrent of "human urine, human feces, toilet paper, other waste products." Not only did the bus' discharge destroy their vehicle, but the family claims that it ruined their clothes and caused about $10,000 in medical bills (they must have left the windows open). The family of five is now in the process of litigation in order to recover $300,000 in damages. If you decide to make a trek to Baltimore anytime soon be sure not to stay more than 48 hours, or at least don't park your car for any longer than that - according to the city, any car that stays put for over 2 days is considered "abandoned." Reason Magazine has a short blurb about it, saying that local resident Milton Boyd, thought his car had been stolen after returning from a two-week holiday only to find out that he owed over $350 in fines and fees to the city after they hauled away his car that was parked legally. Chili - who thought this was ever a good idea? Central California Coast is on the Map! 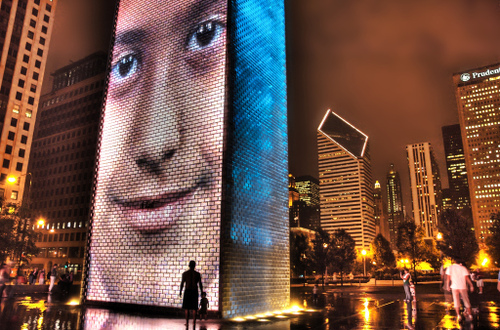 We're proud to announce that TripCart's newest travel guide is now online. Go to our site now to check out our central California coast guide. From the scenic wineries and vineyards of Napa Valley and Sonoma County, to the bustling, world-famous metropolis of San Francisco, to the tranquil, beautiful coastal towns - the central coast of California region has enough attractions and beauty to entertain any tourist for weeks on end. There is no better way to get around the central California coast than on the famous Pacific Coast Highway (PCH or California Highway 1). The PCH is a beautiful drive that begins south of Los Angeles and slowly winds its way up the coast through San Luis Obispo, Carmel, Monterey, Santa Cruz, San Francisco, Marin County, and finally terminates in Mendocino County. This drive takes you through the best that California has to offer - dozens of historical landmarks, amazing views of coastal beaches and cliffs, and access to some of the most famous cities in the country.